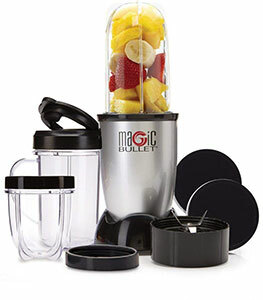 Thinking about buying a Magic Bullet? Quite right, it’s a standard in the world of personal blenders, but is it worth it? Short answer is yes if you know what you’re getting which is an affordable personal blender that is great for making fruit smoothies, it can sort of handle other things but it really stands out as a single serve smoothie maker. If you’re needing something more robust then you want to consider getting a Nutribullet which is the big brother of the Magic Bullet, I’ve reviewed and compared all the Nutribullets here if you’re interested. But now for the long answer about the Magic Bullet, I’ve split this review into different categories so you can see what it’s good at, what it’s not so good at and what it simply can’t do. Like I said, the Magic Bullet is superb at making fruit smoothies, you can throw all your fruit in it, blend it up and head out the door. Then when you get home again it’s really easy to clean, you just rinse the blade under the tap with soap and water and it’s ready to go again, plus the cups are dishwasher safe. A really great way to get more fruit into your diet, and you can even add some protein powder if you want something that’ll leave you feeling fuller. It’s probably one of the easiest ways to start getting healthy. It’s also a really small compact size so you can take it travelling with you, on holiday or on business, you can fit it in a suitcase and keep healthy while you’re away. It’s pretty good at making frozen smoothies, ice can be really hard to blend which is why you need the right blender. The reason it’s only pretty good at it is you get left with some chunks of ice still floating in it, it definitely doesn’t break down into a nice smooth texture. It comes with the price point and power it is, at only 250 watts it’s not very powerful so you can’t expect too much from it. So throwing in some ice will keep it cool you just occasionally get a crunchy bit of ice, which I kind of like but I know a lot of people aren’t a fan. It’s also pretty good at chopping, I’m sure you’ve seen the adverts of it making all sorts of kitchen goodies, which isn’t quite the case in reality, but it’s still pretty good at it. Following on from that it’s not very good at making margaritas because it just can’t quite crush the ice enough. It still can do it but you get a very at home feeling to it, plus the capacity is only big enough to make one at a time. Finally we have what it can’t do, and that’s make green smoothies. It just doesn’t have enough power to be able to pulverise tough greens like kale so you if you do try and make one it’ll come out very lumpy. For green smoothies, or other vegetable smoothies, you need to get the right blender like one of these ones. You’ll struggle to find a standalone Magic Bullet for sale, they mostly come as part of an 11 piece set which is really handy. But what does the set come with? I’ll tell you. You, of course, get the base and the blade (surprised?) but apart from that, you get a short cup, a tall cup, and a sort of mug cup that has a handle. I’ve found these are mostly useful so more than one person can use it, you can all make your own smoothies in your cup then blend them one after the other. Then of course you get lids, you get two keep fresh lids which are for storage and one slip top lid to take on the go. Plus you get two lip rings which crew on and let you drink out of them, otherwise, the screw top causes them to dribble. And as a last bonus you get a recipe book as part of the user guide to help you get started. For when you do buy one I just want to share some tips on the best way to use it so you can get the most from it. When you’re filling it up for the first time you’re going to want to fill it right up to the brim, bad idea, you want to leave some space at the top so it can circulate and blend properly. About three-quarters full is normally ideal, or once it’s blended down to a liquid you can add some more in, just don’t cram it full initially or it won’t blend. You don’t want it to jam right? Then chop up your ingredients before you put them in, the magic bullets only small after all, if you put in a whole apple it’s going to struggle to know what to do with itself. I don’t mean you have to spend your time cutting blueberries into quarters or anything that extreme, just if you’re putting in anything large roughly chop it first, otherwise I promise you it’ll jam and you’ll have to take it out and chop it up after. Another definite must is putting in enough liquid, if you only put in fruit it won’t mix properly while it blends, it needs some liquid with it to help loosen everything up, milk or orange juice are the two standards depending on what you’re making. And on that, put your liquid in after, otherwise it splashes everywhere and you’re much more likely to overfill. It’s easier to put all your fruit in first then top it up with whatever liquid you’re using. 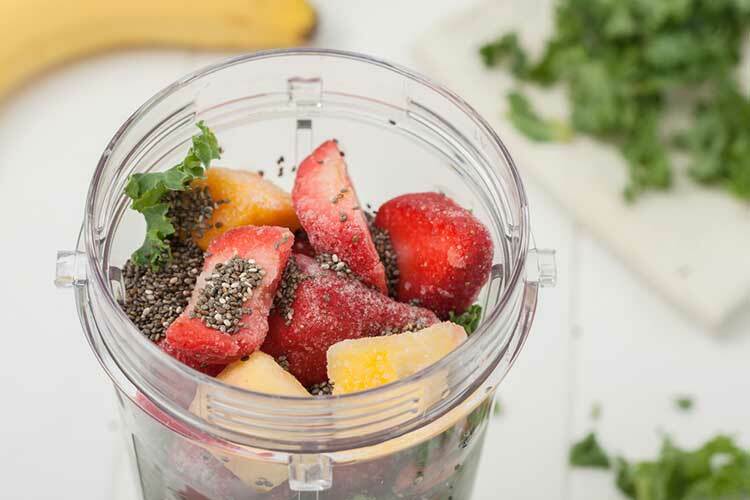 Overall I’d give this blender a B+ because for the low price it is you can have some really nice smoothies easily and at home to start getting healthier and that’s always a good thing. Click Here to go to Amazon read some other reviews and order yours today!